For some publicly traded 3d printing companies, 2016 was a tough year. For others it was a good year, and for 3D Systems it was an excellent one. 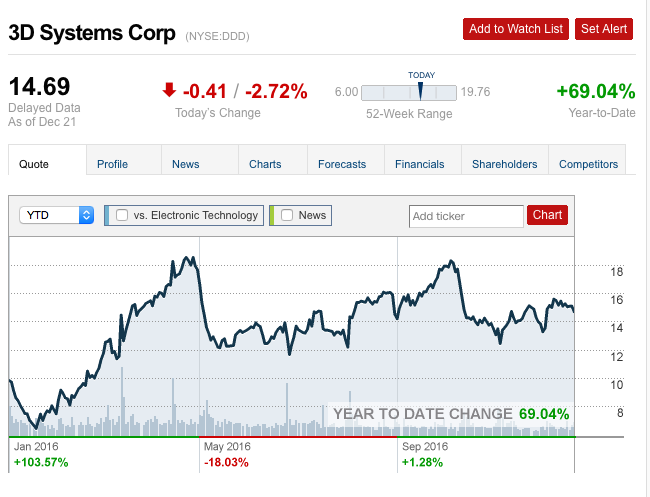 As of December 22nd — the date of this article’s publishing — 3D Systems is up 69% YTD ( year-to-date), beating its benchmark NYSE index by nearly 60%. There was a steep rise in the company’s value from January to May of 2016 and then a bunch of months where the company’s value rose, fell then rose again. 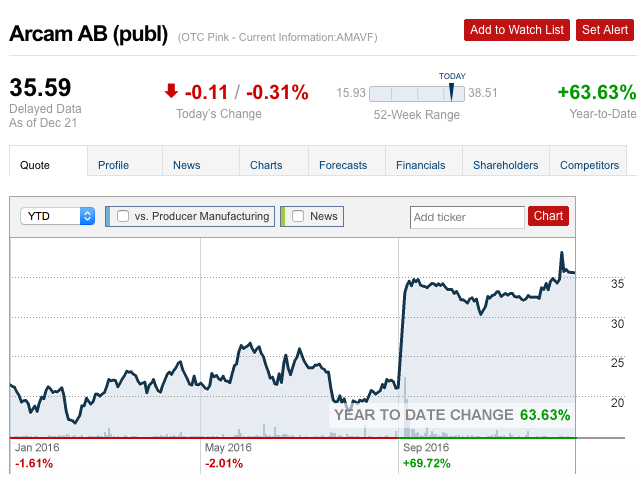 Another big winner this year was Swedish 3d printing firm, Arcam, which trades on the NASDAQ exchange in New York. The company has posted a gain of nearly 64% YTD, with most of the good news coming after September, around the time that the company announced sales had increased ~10%. 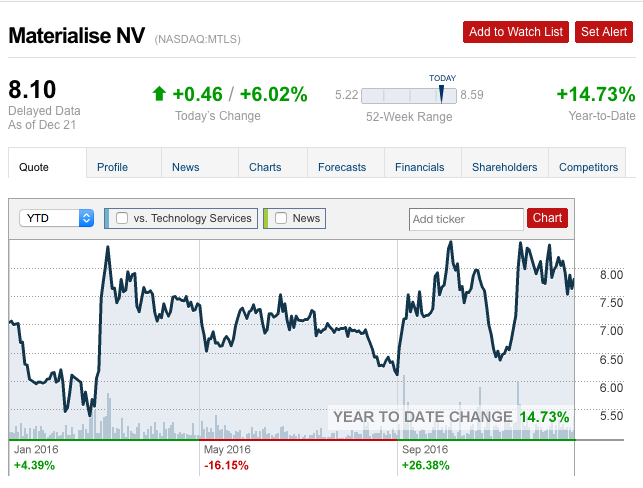 The other winner this year was Belgian based Materialise, which trades on the NASDAQ and is up nearly 15% YTD. 2016 was also a momentous year for 3d printing in the equities markets as the first ETF focused solely on 3d printing was launched. The ETF known as PRNT holds a basket of publicly traded 3d printing companies, allowing investors to track the industry and diversify risk by owning multiple companies instead of just one or two. 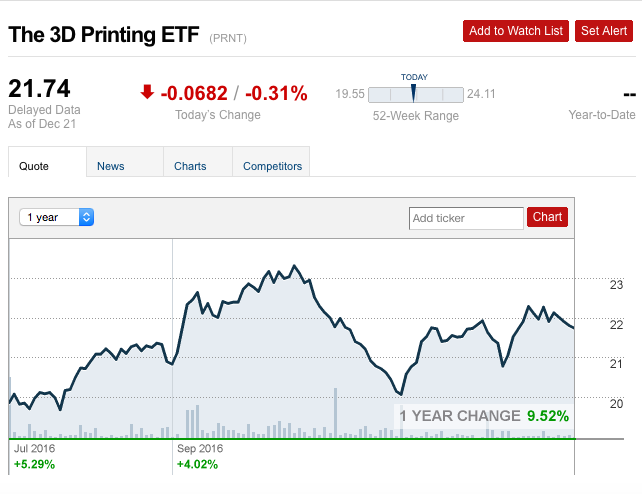 PRNT is up ~9.5% since launching this summer. Quick Review of 3D Printing Stocks in 2016 was originally published in 3dprintingtech on Medium, where people are continuing the conversation by highlighting and responding to this story.